It all started when I stumbled onto this youtube recipe (at the bottom of this entry). Big Mac is one thing. Rice cooker is another. 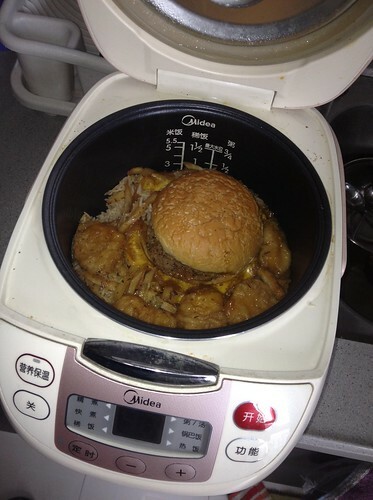 But Big Mac and rice cooker together? And with fries, nuggets and diet coke?? So here are my observations as I go through the process. 1. Rice - 1 cup i.e. this is a meal for 2 persons with a little bit extra. If you are going to cook for more people, you will need to do this twice coz most home rice cookers are not big enough to fit more than 1 Big Mac and nuggets. As for the water level, it will have to be less as you will be topping it up with diet coke later on. 2. French Fries - After washing the rice and leaving the required water as mentioned earlier, it's time to add in the fries. The fries will also act as a buffer to prevent the bottom bun of the Big Mac from soaking up too much water and become too soggy. 3. Big Mac & McNuggets - Add in the burger and the nuggets. You may wanna add the nugget sauce, Sweet-n-Sour/Barbeque/Curry to add a little more taste to your soon-to-be very very confused palate. 4. Diet Coke - Important to note. It has to be diet coke as the sugar in regular coke will caramelise under the intense cooker heat. Don't worry about the rice ending up too sweet coz it won't. Aspartame, the artificial sweetener, breaks down under high heat which is why you don't see them in zero-sugar confectionery (for diabetics). Do not dunk the entire cup of diet coke into the cooker. Add just enough to cook the rice to your desired firmness. A little bit of trial and error is required here. Drink the rest of the diet coke. It's refreshing. No? 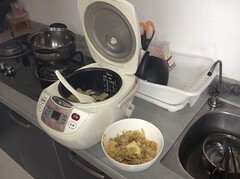 The picture above is the end result when the rice cooker is done cooking. 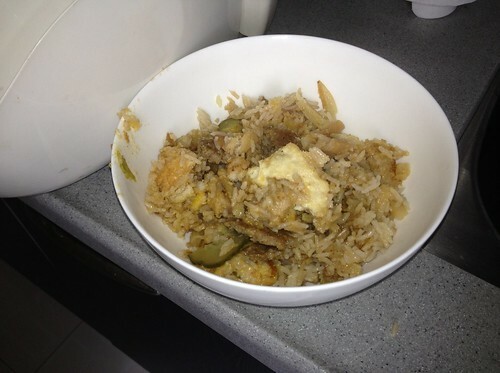 As you can see the cheese, together will all the yummy juices has seeped and flowed into the rice. With the spatula, mashed up the rice, breaking up the buns and the nuggets for a more even spread. An interesting thing is that the battered skin of the nuggets falls off as soon as the spatula disturbs it. What's underneath isn't the "pink slime" that has been the talk of the internet lately. It is just a white piece of meat like as if it is a fillet of chicken breast. (See below for a close up). The rice is mildly sweet with the remnants of the aspartme from the diet coke and a slight hint of the sweet and sour sauce. The rice requires you to slowly chew as the flavours do take awhile to coax it out. Verdict? Surprisingly not too bad and it was a joy to see the conservative, unadventurous AND boring folks cringe and turn up their noses. p.s. Oh and you will have to flip a coin to decide who gets the pickle slice. Here's the video clip mentioned earlier. new kind of fried rice to me. i think if you are adventurous enough, you will try every thing that Macdonalds have on the menu, till you sick of it. Garylee: Yeah, it does look like fried rice, doesn't it? Well, it isn't but it doesn't make any less oily since there is a whole pack of fries in there.